Recently I published a calendar, naming significant events that will be colliding within a few days of each other in the coming months. We could very well be experiencing a monumental, prophetic, water breaking event in our very near future, a gushing outbreak of the outpouring of God’s Spirit and a harvest of multitudes. 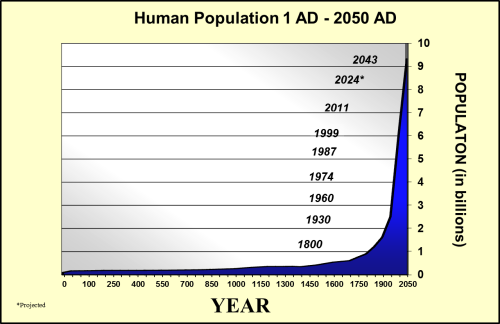 As you can see, the population of the world in the above graph was essentially flat for 1900 years. It took nearly 1900 years to get to the first billion. From the 1930’s to now, the population grew exponentially to seven and a half billion. Today, before our very eyes, we are seeing the world’s population grow to over 7 billion people! And if we suppose the same scenario of ten percent, then in our generation alone, there will be 700,000,000 or so people come to faith! This season, we may see nearly double the number of people entering the Kingdom then all 1900 or so years combined! That’s HUGE! Thank you for the word of God.